The Fed just removed the word "accommodative" from their post FOMC statement. 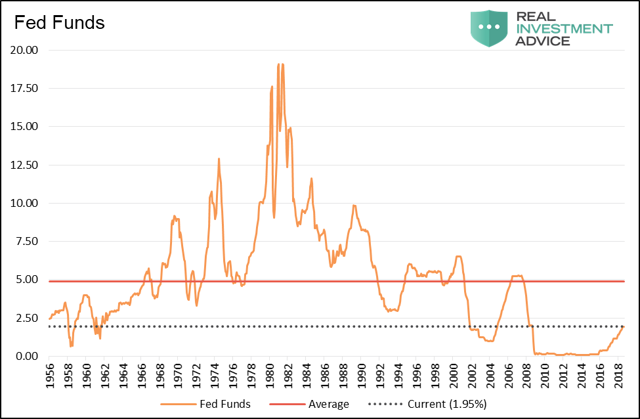 Does this mean the Fed is closer to a terminal Fed Funds rate? This series of charts will help you better determine if the Fed is still accommodative. Here are two statements from the Federal Reserve’s Federal Open Market Committee (FOMC) immediately following their interest rate decisions of August 1, 2018, and September 26, 2018. August 1, 2018 - In view of realized and expected labor market conditions and inflation, the Committee decided to maintain the target range for the federal funds rate at 1.75-2.00%. The stance of monetary policy remains accommodative, thereby supporting strong labor market conditions and a sustained return to 2 percent inflation. September 26, 2018 - In view of realized and expected labor market conditions and inflation, the Committee decided to maintain the target range for the federal funds rate at 2.00-2.25%. The really extremely accommodative low interest rates that we needed when the economy was quite weak, we don't need those anymore. They're not appropriate anymore," Powell said. Interest rates are still accommodative, but we're gradually moving to a place where they will be neutral," he added. "We may go past neutral, but we're a long way from neutral at this point, probably." 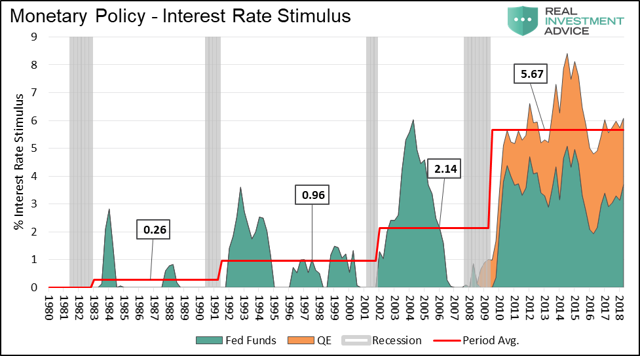 In 2009, with the Fed Funds rate pinned at zero percent, the Fed introduced Quantitative Easing (QE). 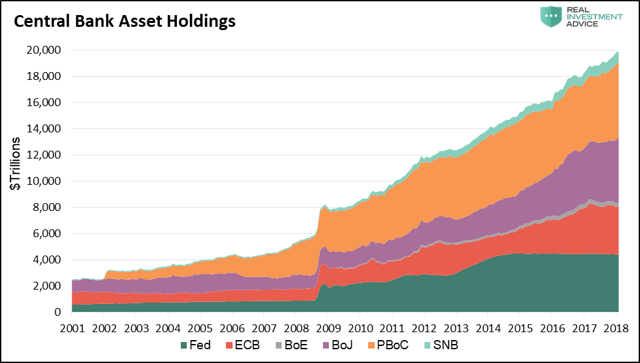 Through three separate acts of buying U.S. Treasuries and mortgage-backed securities (QE 1,2, and 3), the Fed’s balance sheet rose five-fold from about $800 billion to $4.3 trillion. The graph below charts the monetary base, which soared as a direct result of QE and has recently begun to decline due to Quantitative Tightening (QT), the Fed’s active effort to reduce the amount of assets on their balance sheet. 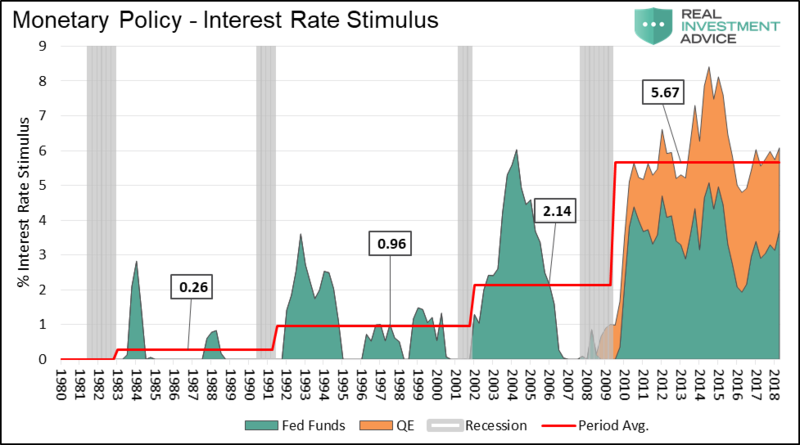 The next graph marries the two methods the Fed uses to conduct policy to quantify the amount of stimulus in interest rate terms. 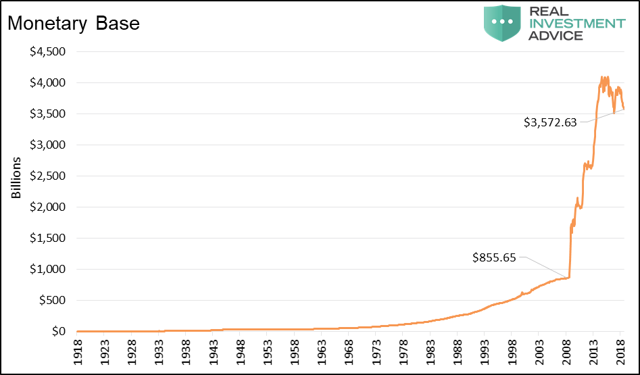 The amount of excess Fed Funds rate stimulus (teal) is calculated as nominal GDP growth less the Fed Funds rate. QE related stimulus (orange) is based on a rule Ben Bernanke laid out in 2010. He approximated that every additional $6-10bn of excess reserves held by banks (a byproduct of QE) was roughly equivalent to lowering interest rates one basis point. Together, the total represents the amount of interest rate stimulus. 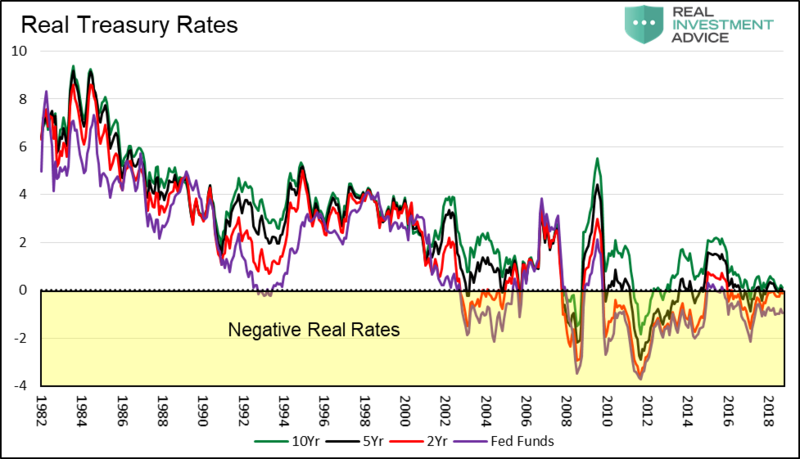 Essentially, the combination of an abnormally low Fed Funds rate coupled with the still outsized but declining gradually, effects of QE argue that stimulus is still grossly accommodative. Incredibly, this is all occurring at a point in time when most economists believe the economy to be at full employment, growth is improving, stocks are at all-time highs and all sentiment indicators are at or near record high levels.